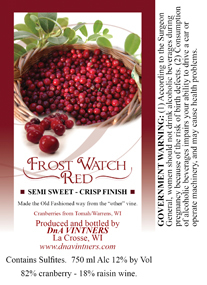 Frost Watch Red  This cranberry wine is semi-sweet with a crisp finish. It starts out in the mouth as somewhat sweet but has a tart aftertaste that reminds one of how cranberries taste with your holiday meal. The "Frost Watch" is the time frame in the spring and fall when the cranberry growers make sure the vines and fruit do not freeze due to weather changes. When the temperatures drop toward freezing, the irrigation pumps are triggered to spray water on the bog to prevent freezing. This enables the cranberries to stay on the vine as long as possible to develop the highest sugar level (brix). Serve room temperature or chilled. Good as a stand alone wine, with chicken or fish, with Chinese food, or served with holiday meals to toast with your friends and loved ones. 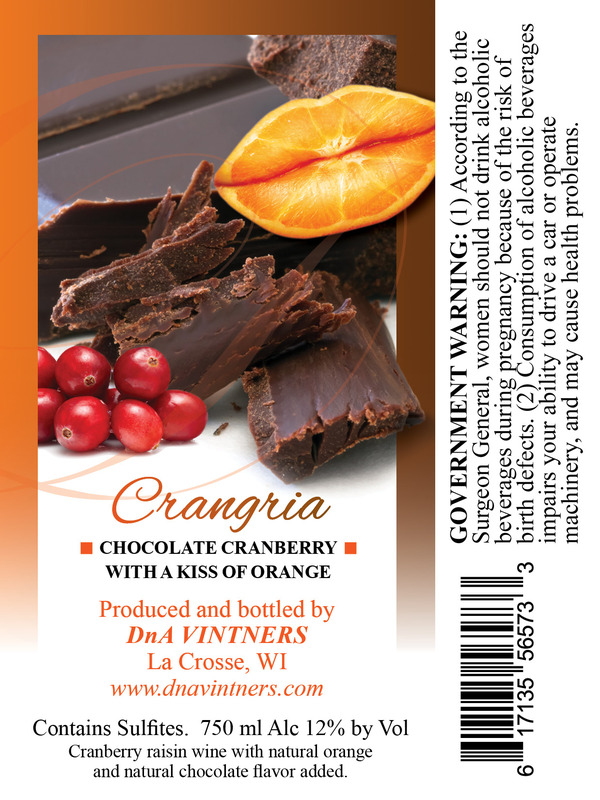 Coming Soon: Currant Wine and Cran Currant Wine - Currants are high in antioxidants. Our currants are sourced from rural Fountain City and are grown without use of pesticides or herbicides. Sweet Paradise  This cranberry wine is sweet and smooth. If you know you love a sweet wine, this one's for you. DnA Vintners main source of cranberries had been Paradise Valley Cranberries, owned by Craig and Kathy Jensen of Warrens, Wisconsin thus deriving the name for this wine. Serve room temperature or chilled. A unique approach to this wine is to heat it briefly, thus bringing out the aromatics of the fruit and creating a "glühwein" or "hot toddy". Pour into a mug, heat for 30 seconds in the microwave (do not simmer or boil), add a sprinkle of cinnamon or a cinnamon stick. A great take-along wine for outdoor activities or use to soothe a sore throat or help with that stuffed-up feeling. Chocolate Paradise - This cranberry wine is infused with natural chocolate flavoring. Enjoy the heady aroma of chocolate from the time the cork is pulled and throughout your sipping enjoyment. It is described as "dessert in a glass". You first notice the chocolate flavor and then the sweet/tart cranberry taste comes through. You may want to share it with family and friends as your dessert OR you may want to keep it all for yourself! 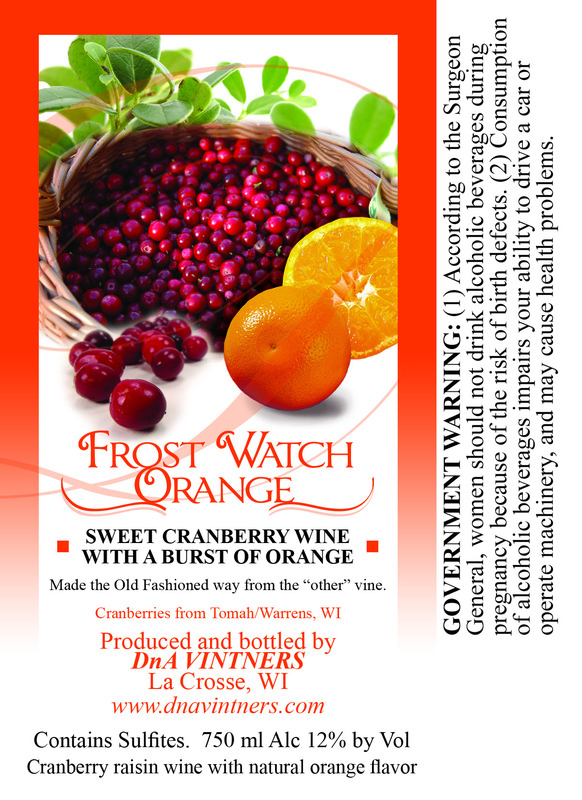 Frost Watch Orange - Reminiscent of cranberry - orange relish at holiday meals, Frost Watch Orange has a strong cranberry flavor with a burst of orange. 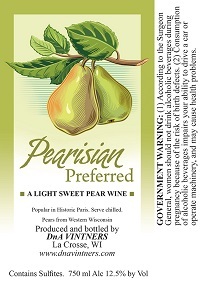 We had lots of fun "taste testing" with friends, family and co-workers to get the flavor encapsulated in this wine. Try it chilled or over ice as a spritzer. Try it heated by pouring into a mug, heat in microwave for 30 second, add cinnamon or pumpkin pie spice. 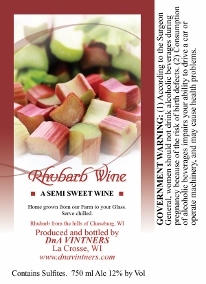 Rhubarb Wine - Our rhubarb wine is made from home grown rhubarb picked at the Larson Farm in rural Chaseburg, WI. Reminiscent of the country wines your (fill in the blank: grandpa, aunt, cousin) used to make! This is a sweet wine. Best wishes from our farm to your table! 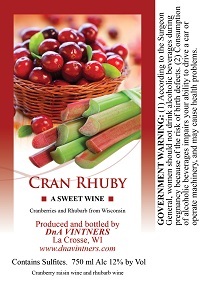 Cran Rhuby - A pretty rose color, this wine is a blend of cranberry wine and rhubarb wine. It is a sweet wine without being "too" sweet. 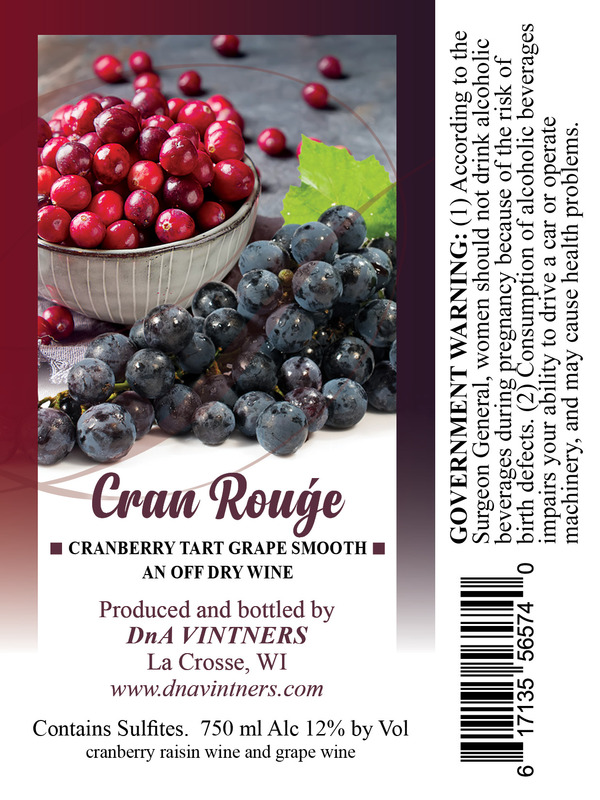 Cran Rouge - This is a blend of cranberry wine and red grape wine. It is an off dry wine and features the tart cranberry and smooth grape.